It has been a week to forget for Russian sport. First the ban over doping which threatens their athletes' participation in the Rio Olympics, then a humiliating group-stage exit from Euro 2016. During Monday's 3-0 defeat by Wales which sealed their fate and led coach Leonid Slutsky to offer his resignation, Ukrainian commentator Andriy Stolyarchuk compared the Russia team to a "Chinese counterfeit which breaks every time pressure is put upon it". "I wonder what words journalists will use to describe this defeat, and what words the Russian football bosses will use to justify themselves," he added. In fact, the Russian press, often keen to put a positive spin on the country's exploits, could not hide its disdain. A "disgrace" and a "humiliation" is how football pundit Valery Reingold described the team's performance in Izvestia newspaper. Former player Aleksandr Bubnov called Russia "the weakest team at the Euros," adding: "Two years before hosting the World Cup, the only thing we have right now is total confusion. There is no coach, no leader in the team, not even a defined skeleton of a future team." Kommersant observes that during the Wales game, "Russian fans - at first so sunny and cheerful - stopped looking at the field and started looking over their shoulder, trying to figure out how to leave the stadium as quickly as possible". Sport Express summed up its feelings in a one word headline: "Toulousers". The front page of Russia's Sport Express newspaper reads "Toulousers"
France's Le Monde said: "These are nasty times for Russian sports and for [President] Vladimir Putin" and describes a "disturbing fiasco for the country that will host the World Cup in 2018". Spain's El Pais carried an interview with former Russia midfielder Aleksandr Mostovoi, who said Russian players "lack the ambition to compete" and that none of the current squad would make it into the team he played in through the 1990s. However, he predicted that the World Cup would be a success: "Russians are unique. Half the country is poor, but the other half has a lot of money and the organisation will be perfect." Germany's Die Welt observed an incident during the game that exemplified Russia's failings. 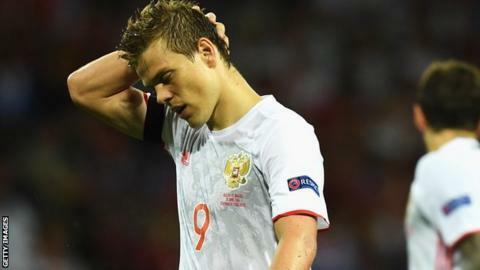 "Symptomatic of the shockingly weak state of the Russian team was a scene at 52 minutes when Roman Shirkov was taken off and his captain's armband was given to substitute Alexander Golovin. But he did not want to have it and was desperately looking for another leading player. But there were none," it wrote. Ukraine's Segodnya described the incident as "nothing but a circus", while Ukraine's Champion newspaper said: "The only things from this tournament that will remain in the Russian memory are scandals, fights and clashes between fans. But not the way the footballers played." And no sporting failure would be complete without a healthy dose of social media memes. Belarusian website Tribuna, compiled several of the best. In the first image, President Putin is seen saying: "These were not our footballers. These kits can be bought in any shop" - a reference to his denial in 2014 that separatists fighting in Eastern Ukraine were from the Russian military. The second is a re-working of a famous Russian painting called "An F grade again" with the words "goal conceded again". The last one says "Aeroflot. Russian airlines. We are flying home". Is this Wales' finest hour? Read more on Euro 2016: Is Wales' 3-0 win over Russia their finest hour?